Facebook is traded on the NASDAQ stock exchange between the hours of 09:30 and 16:00 (EST). How to trade Facebook CFDs? An individual has two options when trading Facebook shares. Firstly, they invest in Facebook shares on the exchanges where they are listed. For instance, you can take part in Facebook (FB) stock trading by buying stock on the NASDAQ stock exchange, so you actually own a share in the company. This can be considered a long-term investment, as the individual is usually waiting for the price to rise over time. Trading the difference: When trading a Facebook CFD, you don’t buy the underlying asset itself, meaning you are not tied to it. You only speculate on the rise or fall of the Facebook stock price. CFD trading is nothing different from traditional trading in terms of strategies. A CFD investor can go short or long, set stop and limit losses and apply trading scenarios that align with their objectives. Facebook was founded in 2004 out of a Harvard dormitory room by Mark Zuckerberg and Eduardo Saverin. Membership of this social network was originally limited to Harvard students, but was then expanded to other colleges in the Boston area, the Ivy League, and gradually most universities in North America. By September 2006, the membership was open to anyone with a valid email address, providing they were aged 13 or older. Soon after the site was launched, Zuckerberg was accused by fellow Harvard students, the Winklevoss brothers, of stealing their idea for the network. This allegation soon turned into a lawsuit for theft and fraud, which was settled in 2008 with a $65 million payment. Co-founder Saverin sued Facebook over breach of fiduciary duty, when Zuckerberg diluted his holdings in the company, Saverin walked away with around 4-5% of the company. In 2012, eight years after its creation, Facebook raised $15 billion in an Initial Public Offering (IPO) that valued the company at around $100 billion at that time. Facebook acquired Instagram in 2012 and WhatsApp in 2014. In early 2018, Facebook was involved in a major political scandal, when it was revealed that Cambridge Analytica was harvesting the personal data of millions of Facebook users without their consent and using it for political purposes. Facebook’s share price fell, wiping $100 billion off its valuation, and CEO Zuckerberg agreed to testify in front of the US Congress. Since then, there have been increasing calls to regulate consumer rights in online media. Is Facebook a constituent of any popular indices? Facebook is a constituent of the NASDAQ 100, S&P 100 and S&P 500 index. What factors affect the Facebook (FB) share price? 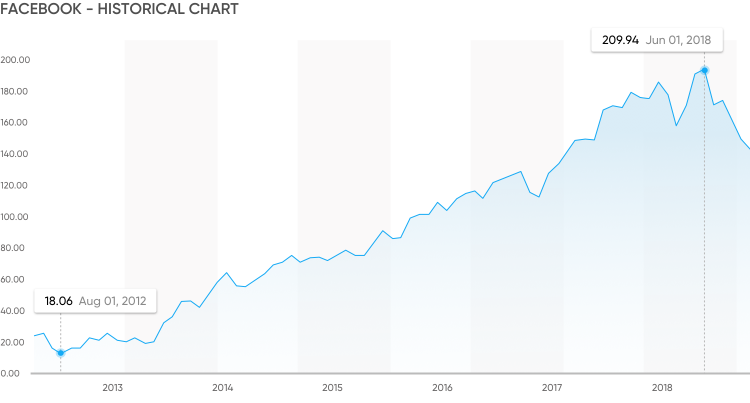 As with any equity, quarterly earnings announcements, as well as the financial performance of the wider stock market are two crucial factors to watch when deciding how Facebook stock will perform. User metrics are a driving factor in Facebook’s stock price. User metrics are important because it determines how much advertising reach the company has, as is seen in the Facebook stock history. The average revenue per user is an important metric, for instance, that measures how efficiently Facebook is monetising the number of users. As well as this, since Facebook is heavily reliant on advertising, it is particularly sensitive to the overall economy of countries it operates in. Regulation and concerns about data privacy also will have an impact on Facebook share value, which was hit drastically in the wake of the Cambridge Analytica scandal. Who are Facebook’s main competitors? Facebook’s main competitors, given that it already owns Instagram, are Twitter and Snapchat. In the social media sphere, Twitter competes for users and their engagement, but the nature of Twitter makes it less of a direct competitor than Instagram used to be. Mobile applications like Snapchat, where individuals interact through sending photos to each other, also competes for user engagement but, like Twitter, Snapchat is an indirect competitor.